Surveillance footage from a doorbell security camera captured the heartbreaking moment a toddler was left abandoned outside a stranger’s home in the middle of the night in a suburb of Houston, Texas. The Montgomery County Sheriff’s Office released the 23-second video Thursday morning, just hours before authorities were able to identify the 2-year-old boy and the adult who left him behind. 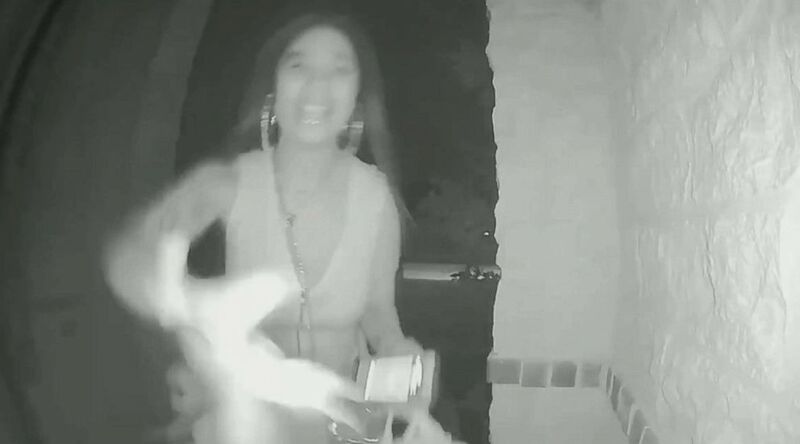 The footage shows a woman carrying two bags and holding a toddler in the air by his arm as she runs toward the front door of a home in Spring, Texas, some 25 miles north of Houston, on Wednesday night around 8:20 p.m. local time. When she reaches the front entrance, the woman puts the child down, repeatedly rings the door bell and knocks several times. She then drops the bags she was carrying, runs back to her parked white vehicle and drives away, leaving the little boy behind. Surveillance footage from a doorbell security camera captured the moment a toddler was left abandoned outside a stranger’s home in the middle of the night in a suburb of Houston, Texas, Oct. 17, 2018. According to the sheriff’s office, authorities received a 911 call from someone who said she went to answer a knock at her door and found a child standing there alone. The little boy was not injured and “appears to be in good health,” the sheriff’s office said. Authorities later determined the identity of the little boy and his family after his father saw the video and “immediately recognized the child as his son,” Spencer told reporters at a press conference Thursday. The father, whom authorities did not name, lives next door to the house where his son was dropped off. Investigators learned that the father had received a text from the child’s mother, who was in the hospital at the time. The text said a friend would bring the toddler to his house on Wednesday in the early afternoon. When that didn’t happen, the father assumed the mother’s plans had changed and he left his residence for the evening, according to Spencer. The woman seen in the surveillance video dropped the little boy off at the wrong home. The woman is not the mother of the child and authorities are not releasing her identity at this time, Spencer said. “The female in the video then left the location without verifying anyone was home or who she was releasing the child to, which placed the child in great danger,” Spencer said. The woman could potentially be charged with child abandonment, which is a felony of the third degree in Texas. Investigators will interview her once they finish speaking to the child’s mother, according to Spencer. “Right now, we are ecstatic that the child’s father has been found and detectives are working with Child Protective Services to reunite the child with the father and family,” Spencer said.